The Daughters of the American Revolution (DAR) is an organization founded in 1890 by four women—each with fathers or grandfathers who were patriots of the American Revolution—to promote historic preservation, education, and patriotism. Since its founding, the DAR has admitted close to one million women, all of whom share the common bond of having an ancestor who helped win American independence during the Revolutionary War. 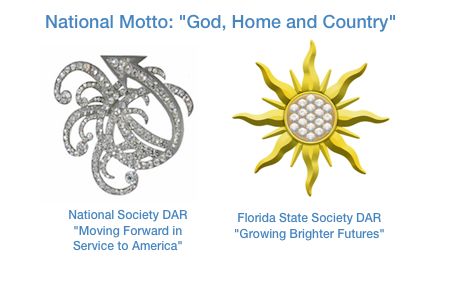 Today, with 185,000 members in more than 3,000 chapters worldwide, the DAR is one of the world’s largest and most active service organizations. Every year, DAR members volunteer millions of hours of service in communities throughout the world. Committed to promoting patriotism, preserving American history, and securing America’s future through better education, Daughters of the American Revolution honor the patriotic service of their ancestors. If you are a woman 18 years of age or older and you have a Revolutionary War patriot in your family tree, you are eligible to join the Daughters of the American Revolution. We invite you to learn more about the National Society and our local Ponte Vedra Chapter through the links on this website or by contacting us. We think you’ll find DAR a wonderful way to become better acquainted with your community and a great way to make a meaningful difference locally and nationally—all while having fun!